What is Food Revolution? Food Revolution is started by Celebrity Chef, Jamie Oliver to stand up for REAL FOOD and Bring Back Food Education. Education is life long and this can't be achieve overnight. In fact Jamie Oliver has been doing it for 7 years! In Singapore, on 19 May 2012. A group of people and foodies who care about this have come together to organise a Food Revolution Day Dinner Party at The Lawn, Biopolis Way, 4pm - 8pm. Follow them on facebook or twitter to find out more. Food Revolution Day on 19 May is a chance for people who love food to come together to share information, talents and resources; to pass on their knowledge and highlight the world’s food issues. All around the globe, people will work together to make a difference. Food Revolution Day is about connecting with your community through events at schools, restaurants, local businesses, dinner parties and farmers' markets. We want to inspire change in people’s food habits and to promote the mission for better food and education for everyone. Another message I got from watching Food Revolution is Pass It On. Teach someone a simple recipe how easy to cook with real food. When people start cooking, they will get to experience fresh and real food. This is also a way of food education. This is a simple Stir Fried Napa Cabbage that I learnt from Noob Cook. The recipe can be found at the website here. Fresh ingredients, Napa Cabbage and Enoki Mushrooms (golden mushrooms) are used. The leafy part of the Napa Cabbage is separated from the stems. The stems were then cut into smaller pieces. For the Enoki Mushrooms, trimmed the ends. I also prepared some sliced gingers, diced garlic and dried shrimps. The dried shrimps were not in the original recipe from Noob Cook. I added it because I like the extra taste and flavours from them. For the sauce, it is a simple light sauce with light soy sauce, water and chinese wine. Cooking is simple. Heat the pan. Put in the gingers, garlics and dried shrimps and fried 1-2 minutes until fragrant. Next is just Step 123. 1) Put in the stem parts of the cabbage for 1-2 minutes. 2) Put in the leafy parts of the cabbage, enoki mushrooms and pour in the sauce. 3) Stir Fried the Napa Cabbage for another 1-2 minutes. So cooking a dish is not that hard. You do not need to have good knife skill or beautiful plating. After all, it is home cooked food who is going to judge you. Support Food Revolution and Pass It On. There is no incentives. This is all voluntary. We are merely playing a very small part to spread awareness. Hello Anonymous, I think perhaps you'd like to leave a name and address the question in a more polite manner. I don't think you are saying it in a mean way but, as you know, it's difficult to read the tone of the comment online. The comment comes across as rude and accusing sgfoodonfoot on petty gains, which I am sure isn't your intention. Your comment can come across hurtful to sgfoodonfoot. If you have met sgfoodonfoot in real person, you'll know he's a very nice guy. Foodrev is an initiative by food bloggers so that people can gain awareness of what goes into the food. The food bloggers are using their valuable time and resources to help the public WITHOUT ANY REWARD at all, so your comment may be inappropriate and unjust. Thanks for support and appreciate your comment. This is just part and puzzle of the reality of the world we are in. We just need to take it positively and reflect how we can do better. nice move here. but who fund/sponsor the event in singapore? 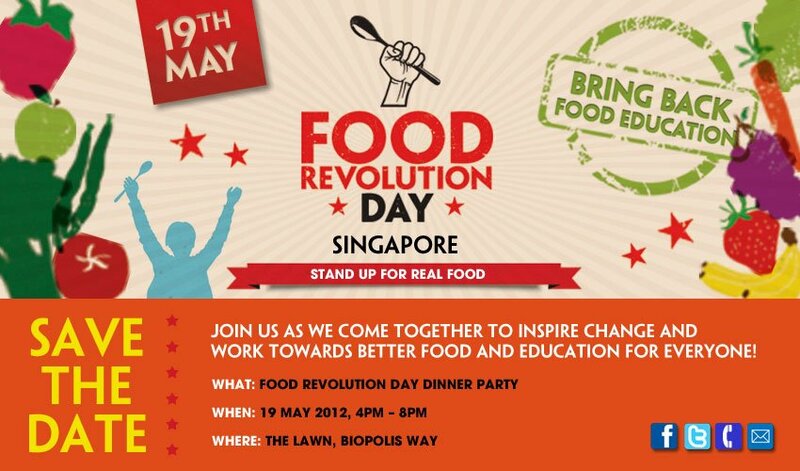 I am part of the organising committee of Food Revolution Day Singapore. The event is entirely on pro bono basis, everyone on our team (we have photographers, videographers, designers, bloggers, chefs volunteering. I have to correct you there Rubbish Eat Rubbish Grow) put in their own time and finances to make this happen. Yes there are sponsors obviously, but we have in no way received any renumeration/benefits from any of them. The sponsors also put in their own resources because they believe in the movement. If you are curious as to who they are why don't you come down may 19th? Also I would appreciate if you would take your queries to our Facebook page, www.facebook.com/foodrevolutionsingapore. But that would require you to identify yourself, if not feel free to email foodrevsg@gmail.com. We would be glad to answer your questions. Let's not hijack Derrick's blog anymore. Dun mind if I give my 2cents? Personally for cabbage especially the stem parts I will cooked it longer. To make it softer and also extract some of the sweetness out. then can have option of thickening the sauce with a little starch.